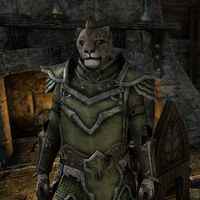 Turuk Redclaws is a Khajiit who can be found in the Salted Wings Tavern in Vulkhel Guard. He is a member of the Undaunted, and you can speak to him if you wish to join. He will tell you about The Banished Cells, adding the location to your map. You will meet him again at the refugee camp outside of Velyn Harbor. Here you may buy him a drink for 0000006969  , which counts towards the This One's On Me achievement. He will also tell you about Tempest Island, adding it to your map. Once you have reached Veteran level and explore Craglorn, Turuk can also be found inside Sanctum Ophidia where he will ask your help to deal with the Celestial Serpent. One of the Undaunted: Join the group of adventurers called "The Undaunted". The Oldest Ghost: Launch a direct assault on the Celestial Serpent. "Greetings, milksop. You must be lost. This is where Undaunted drink, not milksops. Now go away, milksop. This one does not want to catch your milksoppiness." I'm not a milksop. I've fought scarier things than you can imagine. "You've probably fought—what—some mudcrabs and malnourished bandits? Undaunted tackle the big things. Scary things, found only in the dark places of the world. Things with flesh-eating-fists hungry for your face." The Undaunted? Who're the Undaunted? "We are! Thrill-seeking adventurers, every one. We aren't mercenaries like the Fighters Guild, or patriots like the Dominion. We fight to prove we're the toughest of the litter. You want in? You'll have to prove yourself." Yes. I want to be one of the Undaunted. "That's the spirit! What's a centuries old cursed bloodline in the lace of unmitigated bravado? Enter the Banished Cells. Stay a while. Maybe bother a ghost. It you come out alive, see me at the tavern in Vulkhel Guard. We'll talk more then." Will you help me in the Banished Cells? "This one doesn't help. This one has already done his due diligence—seen his share of dangerous delves. His job is strictly to send the uninitiated head-first into unknowable terror. But good luck in there! You'll come back with a story for sure!" After you have entered the Banished Cells and returned alive, you can report your success to him at the Salted Wings Tavern. You will then be initiated with a song. Turuk Redclaws: "Look alive, slobs! We've a new inductee into our group!" Mindil the Untested: "Finally! I'm not the new guy anymore." Venomous Fauridil: "Nope. You'll always be the new guy, Mindil." Tiny Talisse: "Enough. Let's get this over with." (? ): "Always such a ray of sunshine, Talisse. Now a toast from everyone: To the new meat! May they never wet their pants except from drink!" (? ): "To the new meat, whose best attack is showing their face!" (? ): "To the new meat! Too brave to run, too dumb to dodge!" (? ): "To the new meat: Don't die." (? ): "Just sing the damn song." (? ): "Who knows no fear … of beast or blade?" (? ): "Who knows no fear … of Daedric planes?" (? ): "Who knows no fear … of death? Of age?" All: "Undaunted! Undaunted! We are Undaunted!" (? ): "You weren't singing, Talisse." (? ): "You're fat and old." Turuk Redclaws: "Ungrateful fools, the both of you. Go back to your drinking and brooding. And milksop: welcome to the Undaunted." "How are you doing, milksop? Kill any big scary monsters this week?" "What we all do: prove you fear no creature, living or dead. Find the fiercest, wildest, most dangerous monsters in Tamriel, and face them down. Show them the meaning of Undaunted!" What are the perks of being Undaunted? / What do I get for being one of the Undaunted? "We're experienced adventurers. We can teach you skills and tactics a soldier cannot. Our battlefields are the deeps of Tamriel. There's also a cache of weapons and equipment, found on our adventures, for sale. Much more exotic than the local armory." Anything an Undaunted would be interested in around here? "Out by the old Rilis tombs you'll find the Banished Cells. It's just a rumor, but I've heard there's an undead king there—and he's quite a handful for those who guard him. Sounds worthy of a visit. How often do you get to see an undead king?" When you travel to Sanctum Ophidia, you will meet Turuk who requests your help: "You! Milksop! Turuk and his Undaunted need you. All Tamriel needs you! Warn the Guilds. The Alliances. Warn everybody!" Warn them about what? What are you talking about? "A tree spirit. It could speak—had a face out of a fever dream. It leads an entire army of cultists in the caverns ahead. It slaughtered us, showed us ... showed us a vision of what it plans to do to all of Tamriel." What did it show you? "A vision of the future. A future where that spirit escapes these caverns and runs rampant across the continent. I saw the cities of Tamriel, shattered and over-grown. That spirit wants us dead—Men, Mer, Khajiit. It doesn't give a damn." "Turuk was going to dare you to do it. You think like an Undaunted! Or you're crazy. Either fits. That spirit—the Gazers called it a "Celestial Serpent"—will wreak havoc if it ever escapes these caverns. You cannot allow that to happen!" "Must be a cowardly Fighters Guild in these parts, because the Star-Gazers begged Turuk to come with them—to find and dispatch Scaled Court in the highlands. Turuk found them, all right. Too many of them. There's a small army in the caverns ahead." "You could call it that. They slaughtered many of Turuk's Undaunted. We managed to catch one of theirs in return, but this one hopes he will get the chance to pay the Serpent back in full." I want to know more about this place. "The Scaled Court call it home. Inside is a mad temple built by ancient folk. Turuk cannot say he cares. Ask the Scaled Courtling we caught if you want to know more. Hopefully he's in as much pain as Turuk is." Tell me more about the Celestial Serpent. "It has gathered an army of cultists in these caves, for what purpose we could not discover. But it means to slay us all. The Scaled Court here take orders from it alone. The Serpent claims to be responsible for all the turmoil in this region." When you defeat the Celestial Serpent, Turuk appears in the room shortly afterwards, pondering about the Serpent's Apex Stone: "What is this strange stone?" When you talk to him, he questions you: "Have ... have you done it, Milksop? Did you put that spirit down?" I've defeated the Celestial Serpent. "You are five-clawed my friend. Milksop no longer, though it will not stop this one from naming you "Milksop." It seems none among the captured live. A shame, but Turuk will think of them when he sheathes his sword with the belly of a beast." If you are on the Trials leaderboard for veteran Sanctum Ophidia at the end of the week, Turuk will be the author of the mail that you will receive containing leaderboard rewards. For your Dauntless Deeds at Sanctum Ophidia! "This one has spread the word of your unmilksoply heroism in the Sanctum Ophidia, though some embellishment was added for the benefit of those Undaunted who did not survive the Celestial Serpent's Wrath. Turuk assures you that the tales of our sacrifices only add merit to your victories! So taken were the others with these tales, that they insisted we honor you with a show of our respect. Take this and continue to conquer all threats to Tamriel with the same gusto you showed there! P.S. This one reminds you that Turuk was not daunted by the Serpent, he was merely preparing for a second bout." This page was last modified on 20 February 2019, at 02:49.